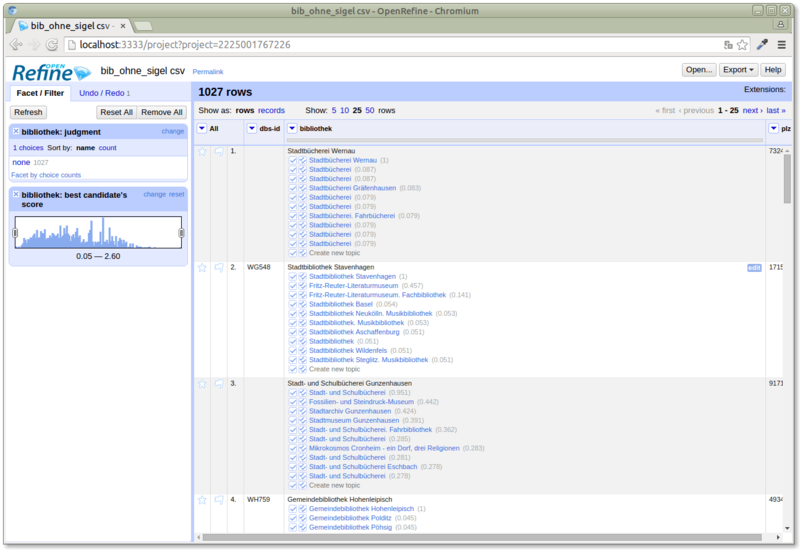 This post is based on a talk I gave at SWIB15 on November 24 titled “LOD for applications: using the Lobid API”. I’m sure that anyone who does library work kind of likes that sentiment, I certainly do. At the same time it makes you wonder how true that statement actually is. Even back then. For instance my grandfather, who was a baker, I don’t think he actually depended on library work. But even more, it makes you wonder how true that is today. I don’t have an answer to that, but to the extend that it is true today, there’s something else involved, and that’s software. Because today software is a thing on which every profession and occupation depends. Well, as the statement about library work wasn’t quite true even in 1925, the statement about software isn’t quite true today. Not all professions and occupations actually depend on software. 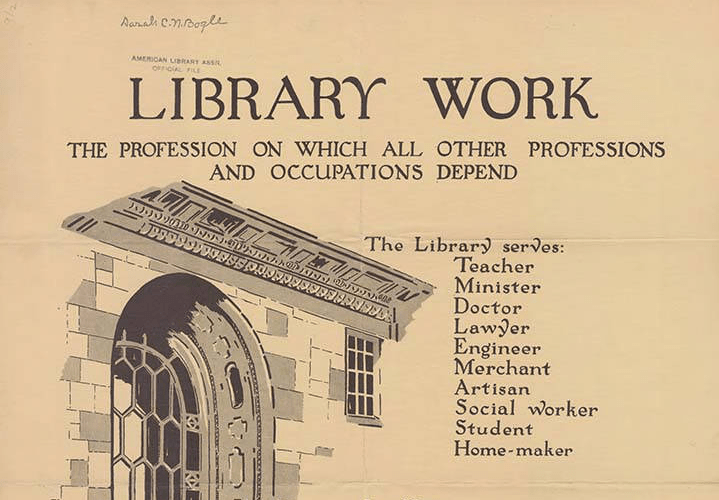 But there is one profession that certainly does, and that’s library work. Because “libraries are software”. The services that libraries provide are provided directly or indirectly through software. 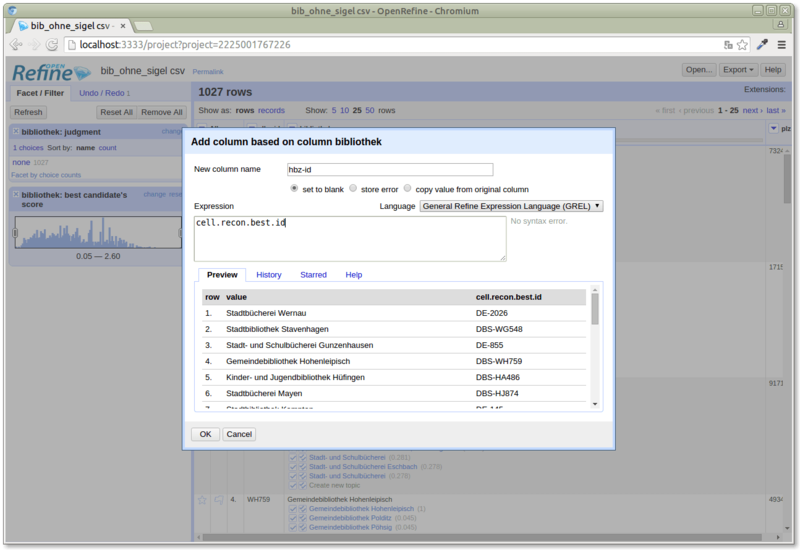 This post is based on a talk titled LOD (Linked Open Data) for applications: using the Lobid API (Application Programming Interface). So why would you want to use an API? Well, because LOD for applications means building software. And APIs make software development manageable. They allow us to build modular software, with stable applications that don’t have to change when other parts of the software change. At the same time, they allow us to have flexible data sources that can change without requiring changes in the applications. That way, the API decouples the applications from the concrete data sources, formats, and systems, which can change without requiring the applications to change at the same time. curl -H "Accept: application/ld+json" -H "Accept-Encoding: gzip"
Here we use curl to call the URL, we pass headers specifying the requested format (JSON-LD in this case) and that we want to gzip the response to save network bandwidth and disk space. curl -H "Accept: application/ld+json" -H "Accept-Encoding: gzip" "http://lobid.org/resource?subject=4055382-6&scroll=20151023" > "resources-4055382-20151023.gz"
So what we get from this is local data, ready for offline usage, but still retrieved from an API. There is no contradiction between local data dumps and APIs, an API is just a way to deliver data.
.@fsteeg "10.200 [Bibliotheken] gibt es insgesamt". Sind eher doppelt so viel, wenn man die Pfarrbibliotheken dazu zählt. The “addressCountry” field is nested in an “address” field, which itself is nested in a “location” field. 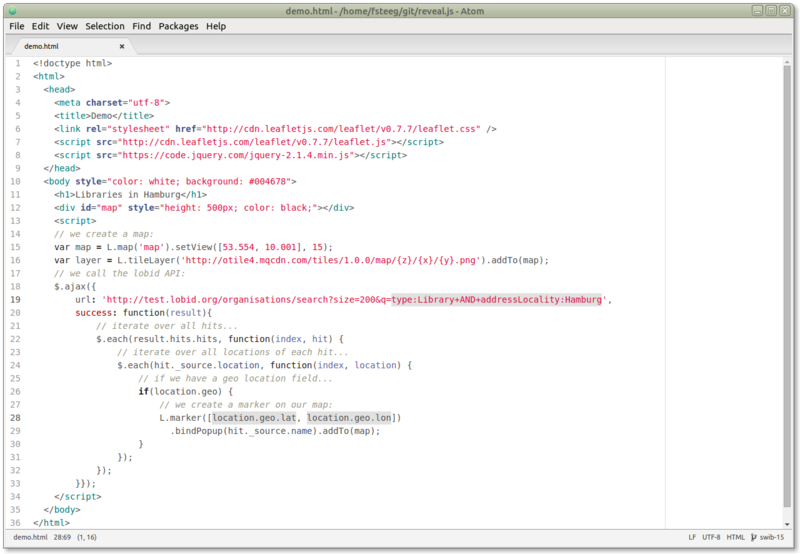 We can express the path to this nested field as “location.address.addressCountry”. So that’s the answer right there: there are 13.285 libraries in Germany, according to our data. 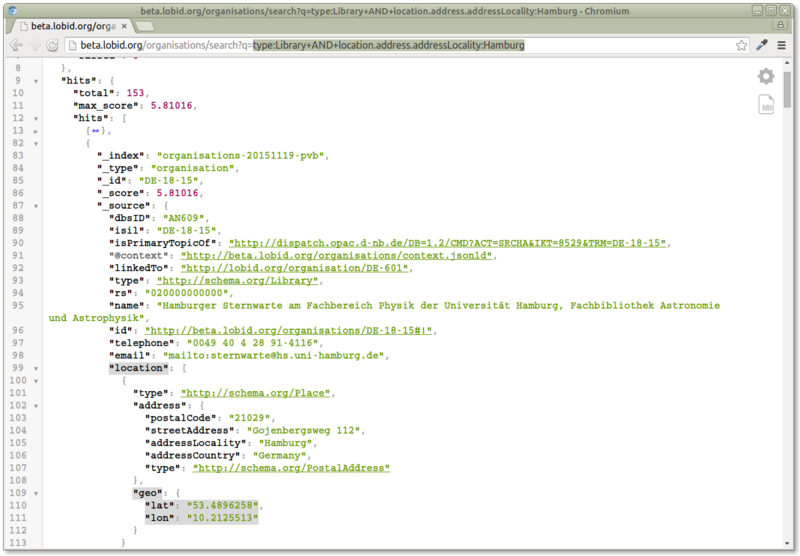 Now the initial result mentioned above said there are 19.347 libraries in Germany, this result now says 13.285. What about that? 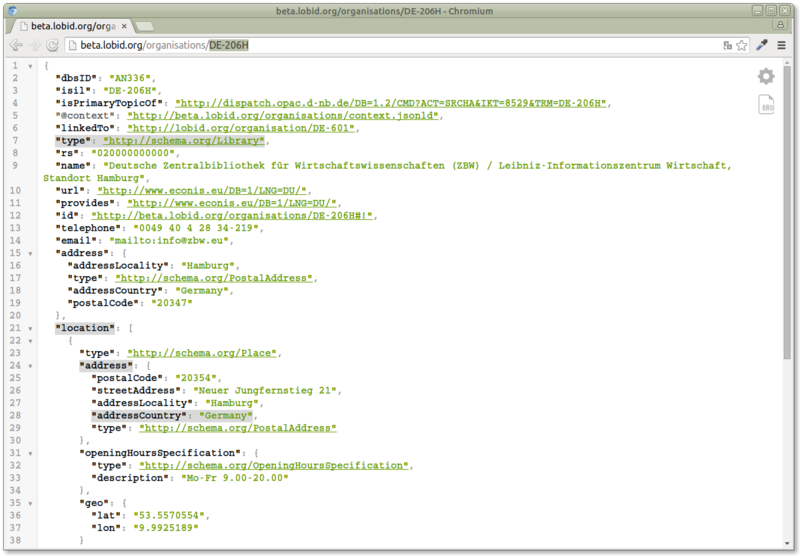 Well it’s really that by using LOD for applications, by using the Lobid API, we were able to improve our query: while our data only contains German organisations, these are not necessarily in Germany, e.g. Goethe institutes. The initial query didn’t consider that. We were also able to improve our data. Because of course when your result is almost the double amout of the traditional answer you sanity check your results, and so we realized that we included organisations that were marked as inactive in our source data (see this issue for details). So we really saw here how usage leads to improvement. Let’s take a look at another application. 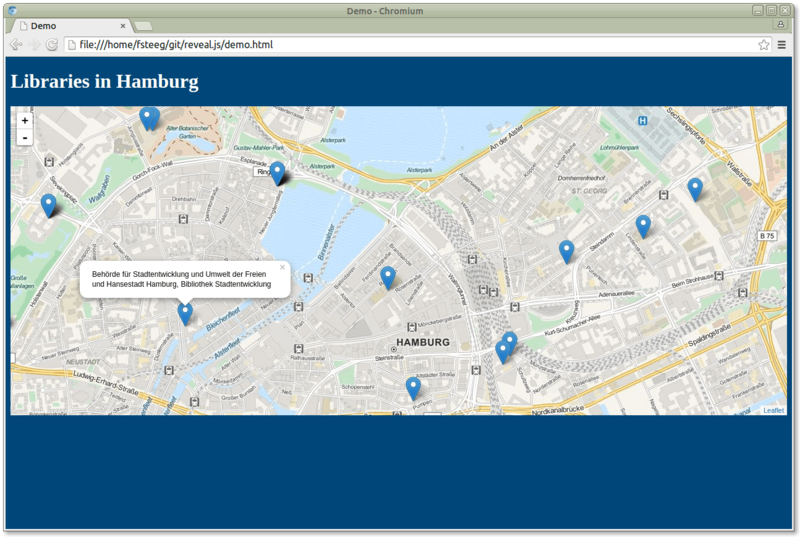 Say we want to visualize data on a map, in particular the libraries in Hamburg. 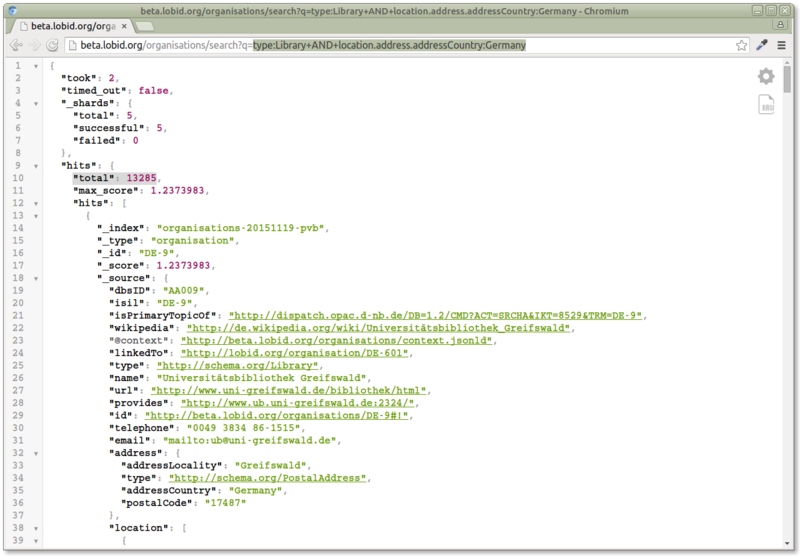 As a starting point, we take a query similar to the one above for answering how many libraries there are in Germany. Only in this case we don’t use the “location.address.addressCountry” field, but the “location.address.addressLocality” field. So that’s how we can build an interactive map using the Lobid API. Next, let’s take a look at a more complex application based on the Lobid API. 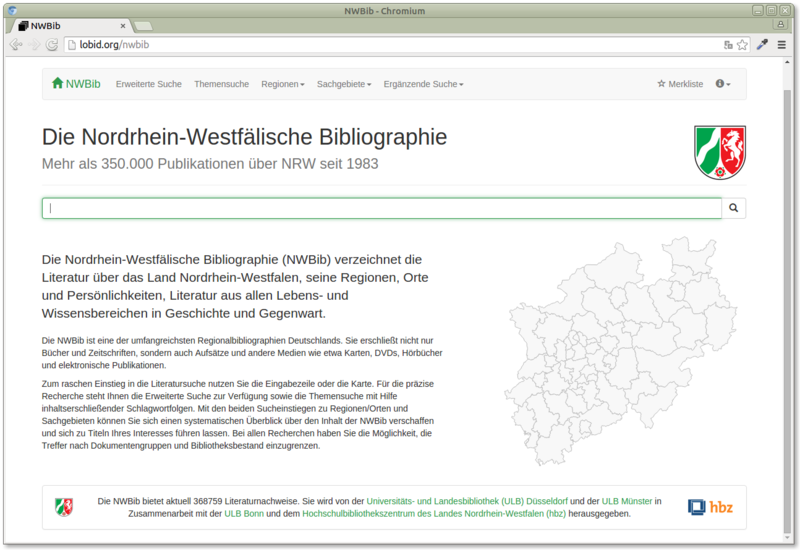 NWBib is the regional bibliography for the German state North Rhine-Westfalia (NRW). 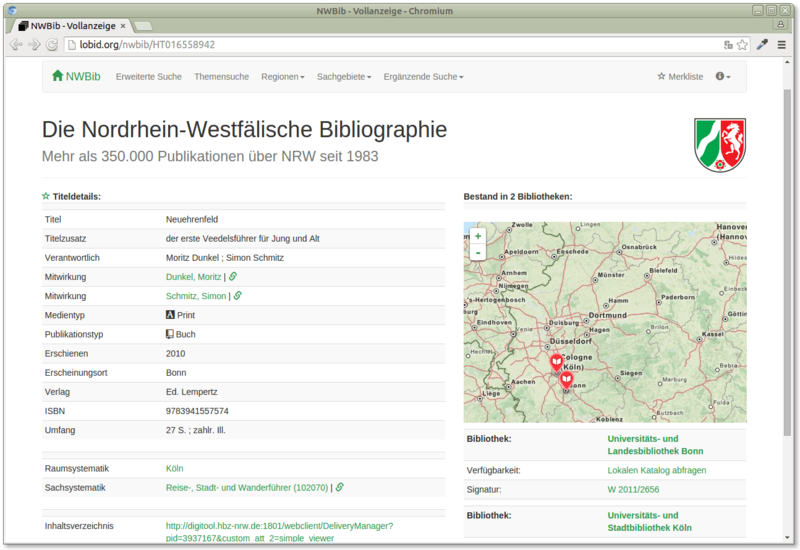 It is catalogued by the three NRW-Landesbibliotheken, the federal state libraries (in NRW we don’t have a single federal state library, but instead a distributed model). 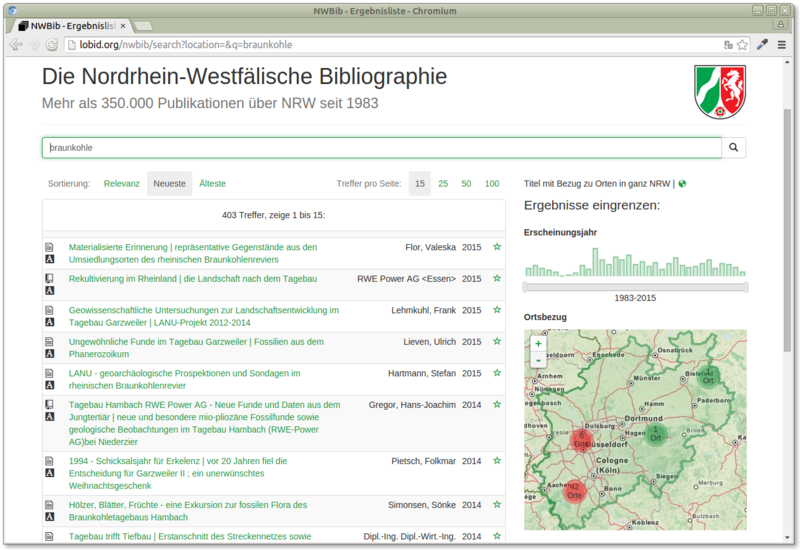 The presentation of NWBib is done by hbz, and its new version, currently in beta, is based entirely on the Lobid API. You’ll notice the map on the right, with markers like in the previous sample application. It’s basically done in the same way, only here it’s not the libraries in some area, but libraries with holdings of the book this page is about. But again, it’s basically the same thing as in the simple example above, just with some more work on the details. 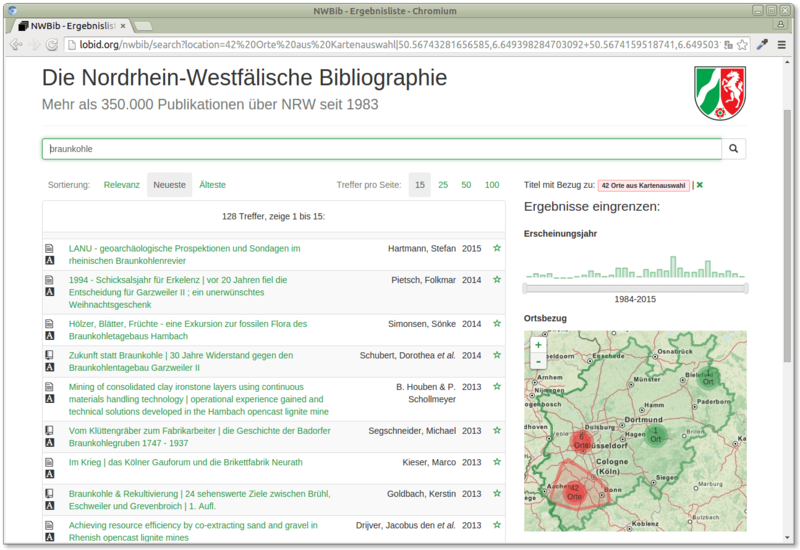 Another interesting map related aspect of NWBib is that cataloguers always record a subject location, i.e. a place that a book or article is about. 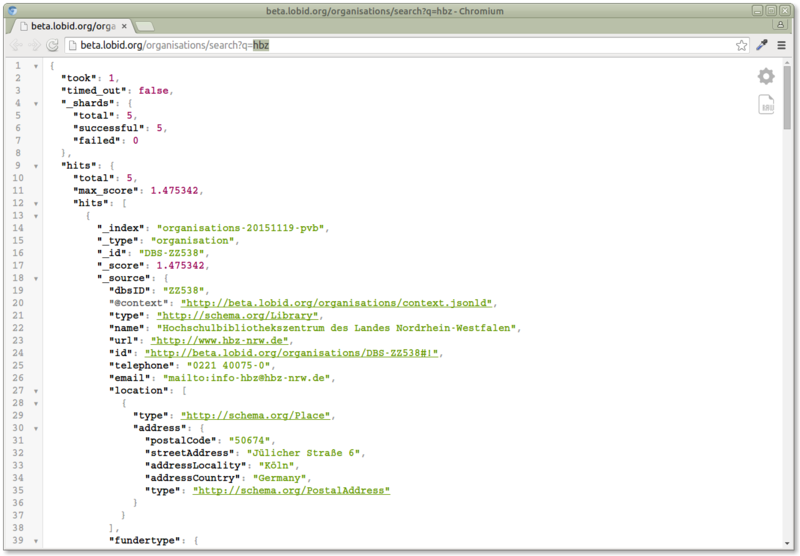 It is catalogued as a simple string, in the example above it’s “Köln” (Cologne). Clicking on one of these areas returns results related to places in that area. Again, the implementation is done basically the same way as in our simple example. Every place is a single marker, the clusters are created automatically using a plugin for the mapping package, Leaflet.markercluster. So that’s how a complex application with map visualization and browsing can look like, implemented on top of the Lobid API, in the same basic way as the simple example above. 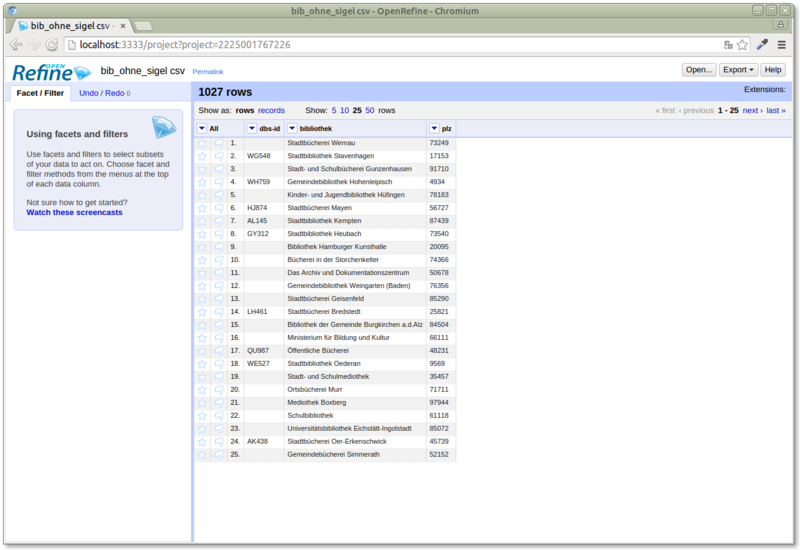 As a final application, let’s take a look at OpenRefine, “a free, open source, power tool for working with messy data”. 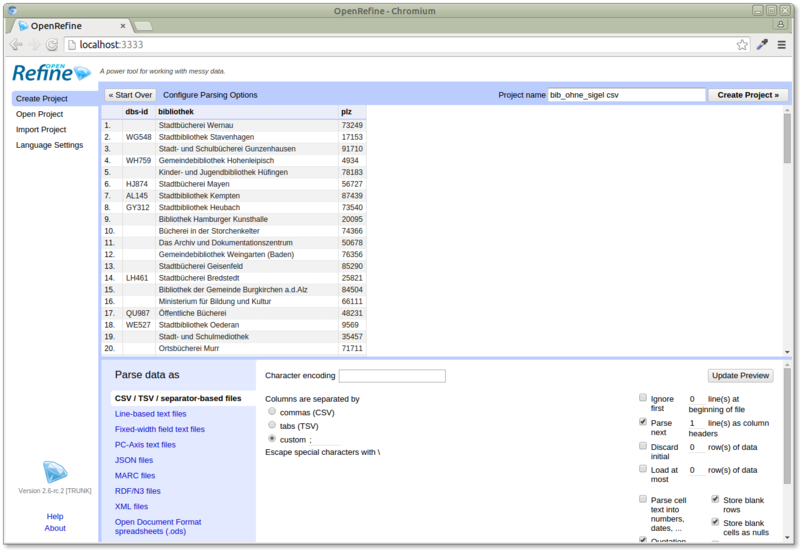 OpenRefine is based on a spreadsheet user interface, so it provides a familiar user experience for people familiar with that kind of software. It can be used to clean up data, to transform data, and to reconcile data with external data sources, like the Lobid organisations API. 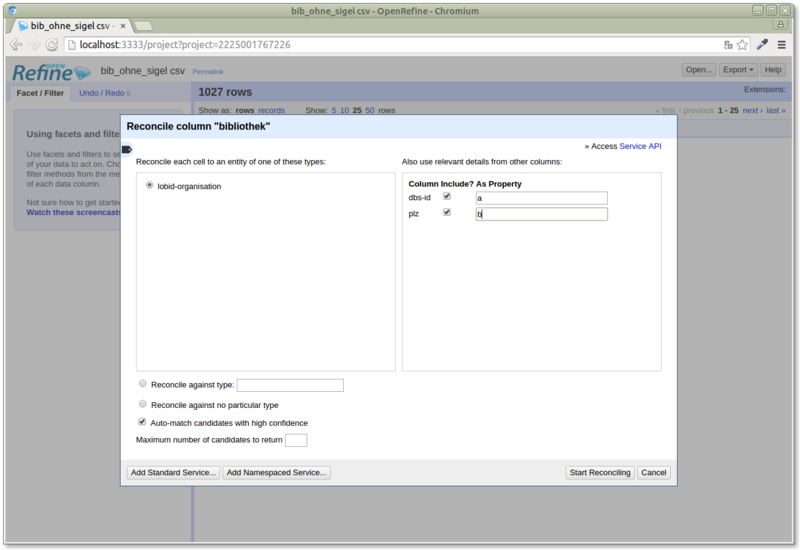 We’ve implemented our OpenRefine reconciliation API in response to a user request, so let’s take a look at that. 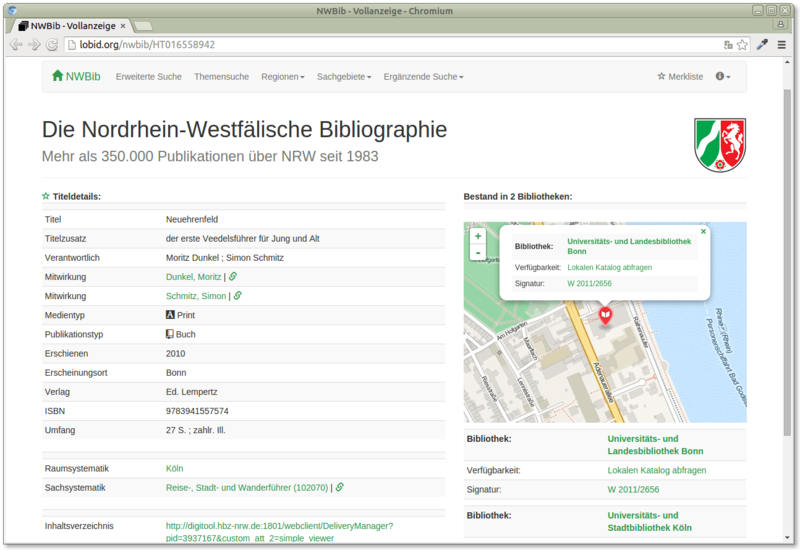 Our user had a table of libraries where every row had a name and a postal code, and some had an ID from the German national library index (DBS, Deutsche Bibliotheksstatistik). What he wanted was a uniform identifier for all of these entries, in particular an International Standard Identifier for Libraries (ISIL), if available. 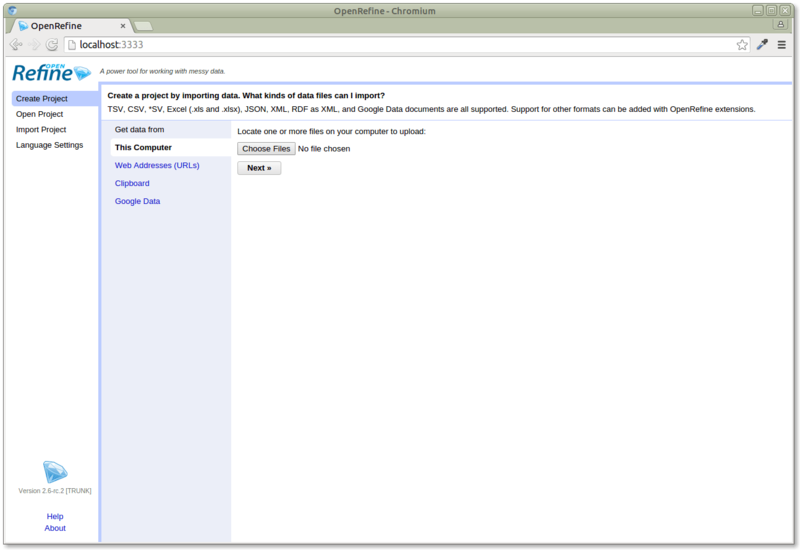 OpenRefine uses the browser for its user interface. You can run it as a local application, it comes with simple executables for different operating systems. You don’t have to upload your data anywhere, it just happens to be browser based. At the same time, this makes it possible to set up a central instance for your organisation and have people share projects and data. Each cell now contains a list of candidates. They are linked to their entries in the Lobid API, so by clicking them we can verify that the topmost candidate is actually a good match. The “best candidate’s score” histogram facet on the left allows us to deselect libraries with very low scoring best candidates (by moving the left slider to the right), so we don’t pollute our data with wrong matches. We could now export the resulting table with the new column as a CSV (or many other formats) to get the reconciled data set. 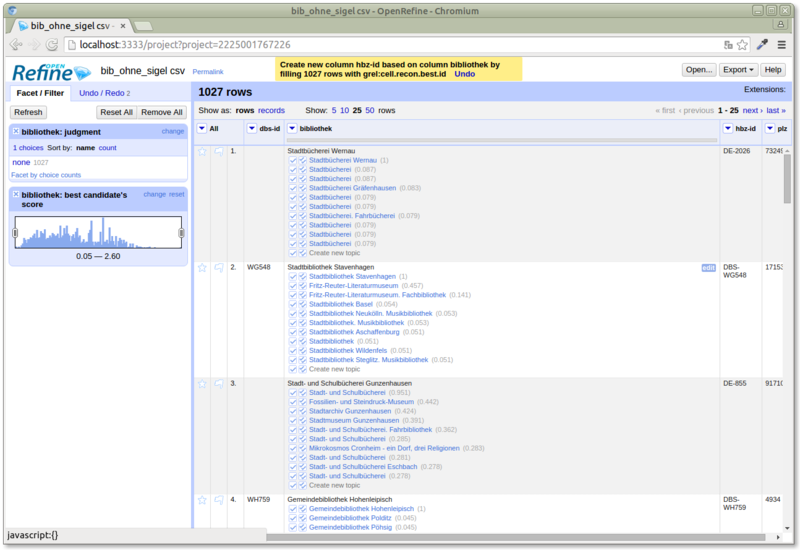 So this is what reconciliation with OpenRefine and the Lobid API looks like. You can download OpenRefine and reproduce these steps based on these instructions. So what did we learn by building and using the Lobid API and applications based on it? We learned that it’s important not to lose useful data for applications in the transformation of source data to LOD. We learned that it’s important to structure data in a way that makes it useful for applications, like for queries and processing responses. And we learned that if possible, we should integrate into existing tools and workflows like OpenRefine, because if people have these tools, that’s where they want to use your data. To summarize, we learned to let applications drive API and data design. To avoid premature abstraction. To support actual use cases before generalizing. Or, to put it another way: “Do usable before reusable”. @edsu Guess what - it turns out having other folks use your stuff makes your stuff better! Software and collections too! So this is how we make progress: by building, using, and improving stuff. A short note on how we built our particular API: We used Metafacture (a Java toolkit for stream-based library metadata processing), Elasticsearch (a Lucene-based search server, something like SOLR, we use it with Java), and Playframework (a Web application framework, something like Rails or Django, we use it with Java). In a nutshell, that’s Java programming with open source tools. But this is just our choice. An API like this could be implemented with all kinds of technologies. Now you might be wondering: but what about Linked Open Data (which is in this post’s title), or even the Semantic Web (which is the topic of the conference I presented this as a talk)? For one thing, the structured data in all the examples above is JSON-LD, it is RDF compatible, we use standard vocabularies where possible, so this is linked data. But linked data and the semantic web are no goals in themselves. They are “a technological solution, one of many that might fit the real goals”. And no matter what our roles or titles are, whether we’re cataloguers, developers, or managers, that real goal is the same: “to make the product better for our users”. And that product is software. So what’s the thing to take away? It’s really that libraries, that we, that you, should build APIs. APIs provide infrastructure for software in libraries. They make the great work of cataloguers available for all kinds of use cases. That’s why “libraries need APIs”.
.@fsteeg Yep. 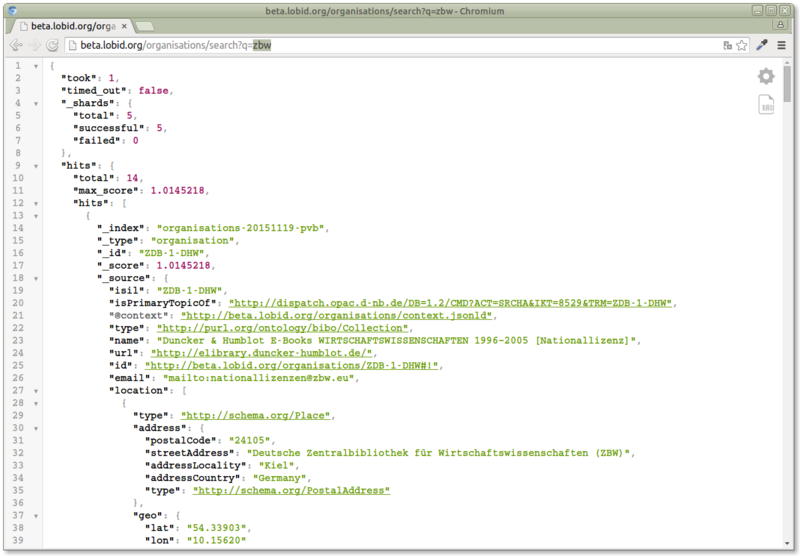 Libraries need APIs, not web portals. They empower yourself and others: to use your data (as we saw in the simple question answering example), to build new applications (as we saw in the simple and complex map-based applications), and to improve existing applications (as we saw in the OpenRefine example). It doesn’t happen by itself. It’s not like you build an API and all these applications magically appear. What it takes is “an API and some large-but-finite amount of labor”. Realizing that I say "it wouldn't be difficult to X" when I mean "there's an API and some large-but-finite amount of labor could X." But APIs are the foundation. They provide infrastructure for software in libraries. They empower yourself and others.